Tyler Perry's Acrimony (film, 2018). A 2018 American psychological thriller film with "R" rating by Lionsgate/Lions Gate Entertainment. Directed by Tyler Perry. Official Trailer. 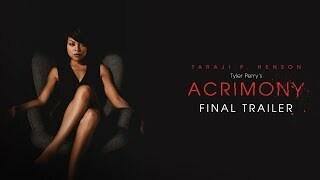 Tyler Perry's Acrimony is a 2018 American psychological thriller film directed by Tyler Perry. 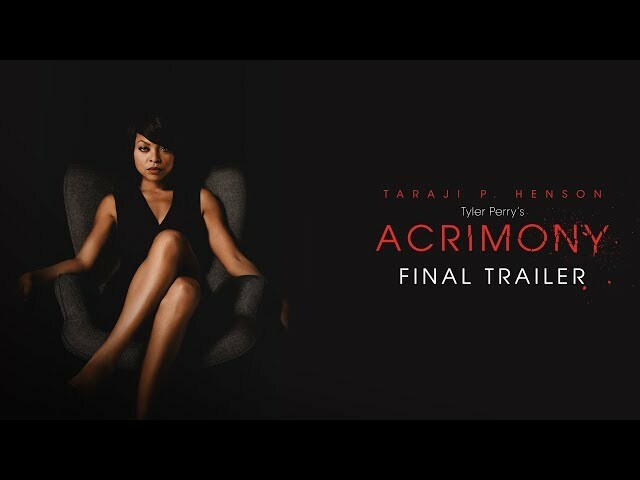 Tyler Perry's Acrimony (2018 Movie) Final Trailer - Taraji P. Henson. Melinda Moore is a steadfast, hardworking wife who supports her husband, Robert Gayle, an engineer trying to sell an innovative battery design. A running total/dwindling balance of the proceeds Melinda receives after her mother's death is portrayed as the couple gets in over their heads in debt, which fractures their marriage over time. The film is divided into categories based in the emotional spectrum that Melinda experiences, as follows: Melinda meets mechanical engineering student Robert during college. The two grow close, with Robert comforting Melinda after her mother dies, introducing her to the music of Nina Simone, and taking her virginity. However, after Melinda catches Robert cheating on her with Diana Wells, in a rage she rams the RV he lives in with her car, seriously injuring herself on the process. Melinda is rushed to the hospital for an emergency full hysterectomy, rendering her unable to bear children. Melinda and Robert reconcile and marry, despite the objections of her sisters, June and Brenda. Years later, Melinda supports them both, as Robert is unable to find work because he is a felon and spent two years in prison for stealing shoes. June and Brenda are leery of Robert's intentions with Melinda's inheritance. Robert talks Melinda into mortgaging their house so he can build a prototype of a revolutionary battery he has been designing since prison, which he hopes to sell to Prescott, a venture capitalist. Diana, now working as an assistant to Prescott, arranges for Robert to have a meeting with him. After finding Diana's wallet in Robert's truck, June and Brenda tell Melinda that Robert is cheating on her. Prescott offers Robert $1,000 a week for life for the design, but Robert wants to license the technology to them instead and declines the offer. Melinda, furious at both Robert's decline of Prescott's offer and his interaction with Diana, files for divorce and moves in with Brenda. Robert moves into a homeless shelter, but Diana finds out and insists that he live with her. The film Tyler Perry's Acrimony was scheduled to be released by Lionsgate and Lions Gate Entertainment on March 30, 2018. The duration of the film is 120 minutes. With a budget of $20 million, the film grossed over $46.4 million. The film had received a "R" rating. Tyler Perry's Acrimony got low rating from critics. The audience dislikes the film either.